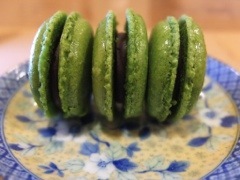 I could hardly wait for the weekend to arrive so that I could make another batch of macarons. 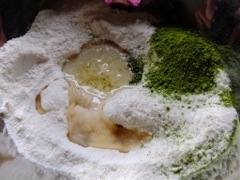 This time using my newly acquired bag of green tea powder. Hmmm the fresh grass smell that whiffs out when I open the foil bag…refreshing! 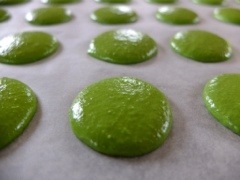 To make these I simply weighed out the ingredients for my macaron recipe, removed 2 tbsp of icing sugar, and added 2 tbsp of green tea powder. 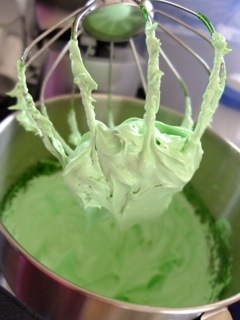 I also used green gel as well. These didn’t come out as crunchy and firm as I normally get them, perhaps it was the humid weather. The shells sunk a bit and were very fragile. Maybe I shouldn’t have followed some recipe’s advice of switching the pans midway…..however the taste hasn’t been affected so that’s ok! This only means one thing – there will be another trial next week!